Description: The Window Belt features diamonds made with a vintage technique. The cords are folded to form an oval-shaped opening (window) in the center of each diamond. 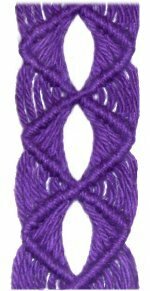 The closure is a braided tie. This Macrame project is rated Moderate. Beginners will need some experience with creating diamonds before successfully making this design. Preparation: Start the Window Belt by measuring your waist or hips. Cut 12 working cords, each 4 times the length you measured. 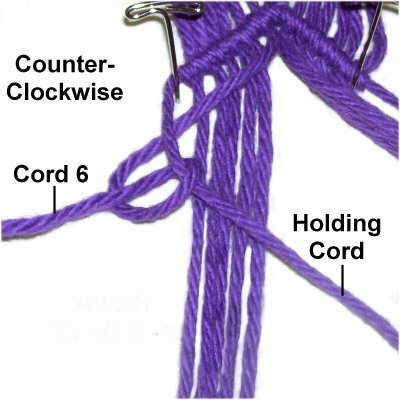 Prepare the tips of these cords with glue or Overhand knots. Cut 2 holding cords, each at least 1.5 times the length you are making. Prepare these cords with tape, so you can identify them easily. Arrange the working cords vertically, in two groups of six. The holding cords should be placed between the two groups. Mark the center by applying a piece of tape across that area horizontally. 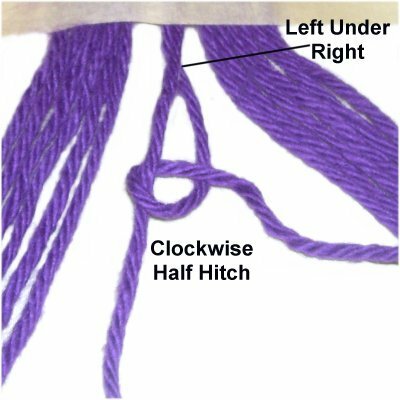 For the first half of the Window Belt, you will start at the center and move towards one end of the cords. Design Tips: Since you are using fine material to make the Window Belt, you cannot secure each cord. So wrap each group around a pin several times. Use a second pin to hold them in place, leaning it over the cords (or use tape). 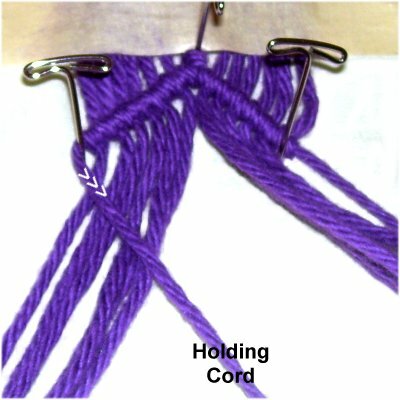 Roll up each working cord to make them easier to work with. 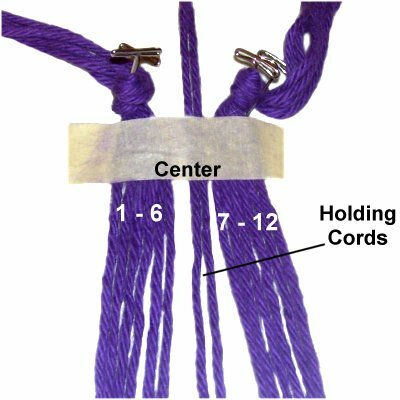 Step 1: The first knot for the Widow Belt is tied with the holding cords only. Cross the holding cords left under right. 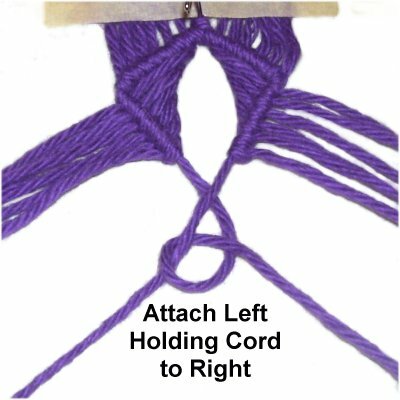 Use the left cord to tie a clockwise Double Half Hitch onto the right. The knot should rest against the tape. Step 2: Arrange the two holding cords diagonally on top of the working cords. The angle should be as close to 45 degrees as possible. Important Tip: It's hard to secure fine cords so they remain taut. 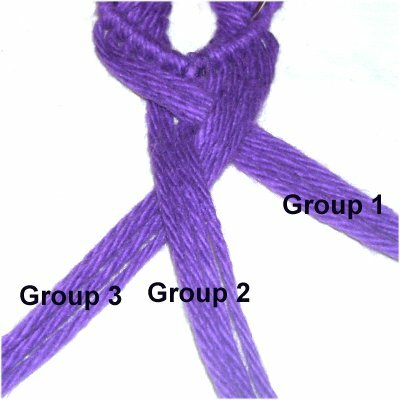 So I recommend you guide the holding cord with one hand while tying the knots with the other. That way you can move the holding cord as needed. Please Note: The holding cords may not be straight in the following images. They were bent so you can see the knots better. When you make this design, keep the holding cords straight and taut at all times. Attach working cords 6 - 1 to the holding cord, in that order. 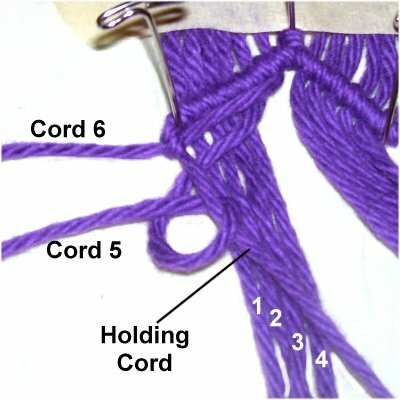 Make sure each working cord is pulled straight as you tighten each knot (see next image). The Half Hitches are tied clockwise, since you are moving right to left (diagonal arrows <<<). Step 3: Attach cords 7 - 12 to the holding cord, in that order. 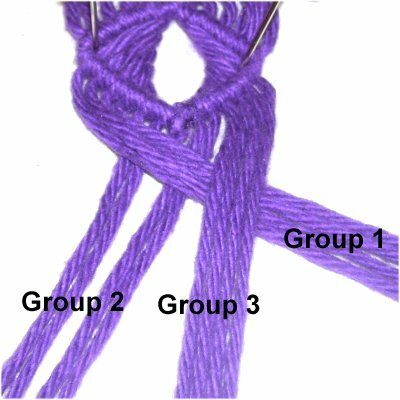 The knots are tied counter-clockwise, since you are moving left to right (diagonal arrows >>>). Step 4: To start the lower half of the diamond, move the left holding cord towards the right diagonally. Try to make the angle as close to 45 degrees as possible. Organize and straighten the working cords. Place a pin at the corner, with the holding cord on the outside of it. Step 5: Locate working cord 6, which is closest to the center. Fold it across the other cords, heading left. Make sure it rests under the holding cord. Tie a counter-clockwise DHH, since you are moving left to right. Make sure it rests against the pin at the corner. Step 4: Attach cords 5 - 1 in the same manner, folding each one across the others. Step 5: Move the right holding cord diagonally towards the left, after placing a pin at the corner. 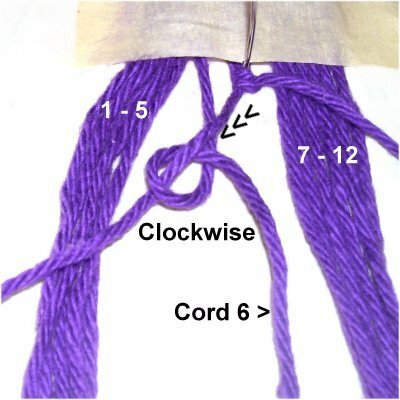 Attach cords 7 - 12 to it with clockwise DHH, folding each one across the others. 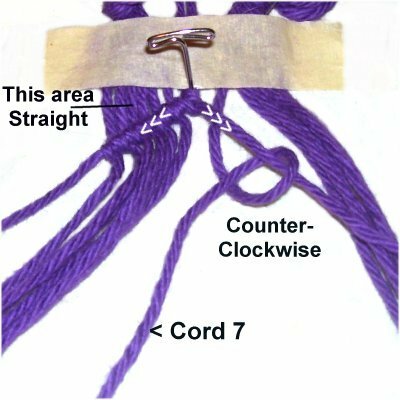 Step 6: To close the first diamond for your Window Belt, attach the left holding cord to the right holding cord with a clockwise DHH. Run your finger along the edges of the window inside the diamond to make it as oval shaped as possible. Step 7: Repeat steps 2 - 6, creating the remaining diamonds for the first half of the Window Belt. Make sure you only tie enough to make 1/2 the size you are aiming for. For the top half of each diamond, attach cords 6 - 1 and 7 - 12 (in that order) to the holding cords. Try to keep the cords straight in the area above the row where you are working. That will result in a gentle curve once all the pins are removed. 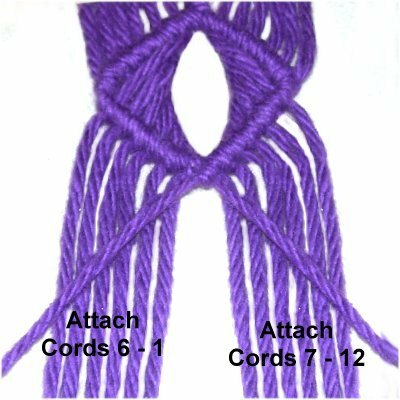 For the bottom half of each diamond, start with cord 6, followed by 5 - 1, folding each one across the others to the holding cord on the left. 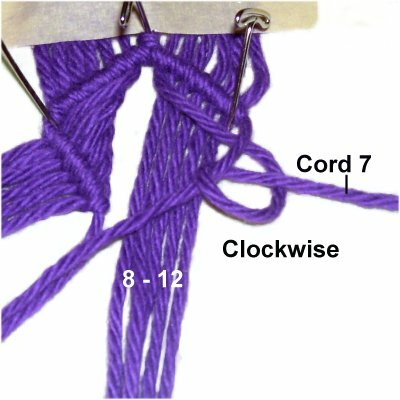 On the right, start with cord 7, then attach 8 - 12. 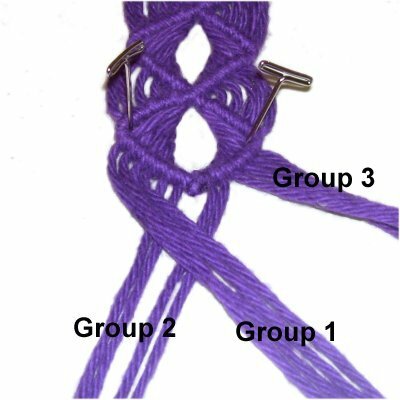 Close the diamond by attaching the left holding cord to the right. Step 8: When the first half of the Window Belt is finished, turn it completely around and go back to the center. Repeat steps 3 - 7 to make the second half. 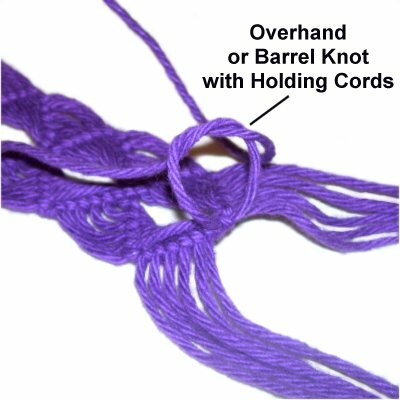 Step 9: Tie off both ends of the HOLDING cords by tying them together with either an Overhand or Barrel knot. Add glue and cut off the excess when it's dry. 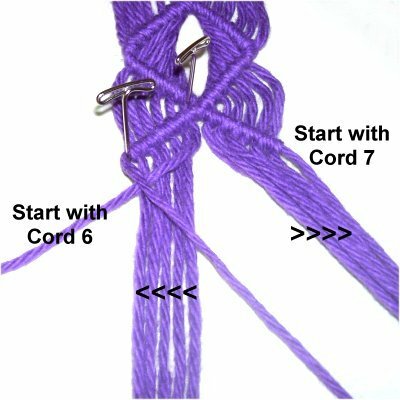 Now you will create the braided tie to form the closure for the Window Belt. 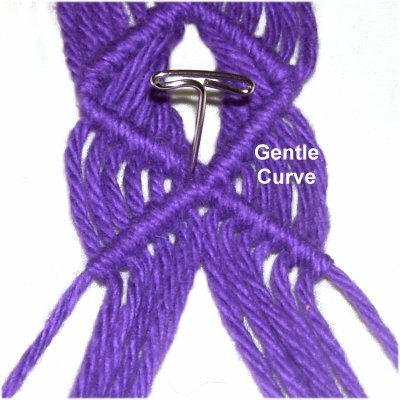 This is optional if you prefer to create a different type of clasp or closure. Step 10: Arrange the working cords into three groups of four, and mentally label them (left to right). Move group 1 to the center, between the other two groups. It should pass over group 2. Step 11: Move group 3 to the center, between the other two groups. It should pass over group 1. Step 12: Move group 2 over group 3. It's now in the center, between the other two groups. Step 13: Repeat step 10 - 12 to continue braiding the tie. 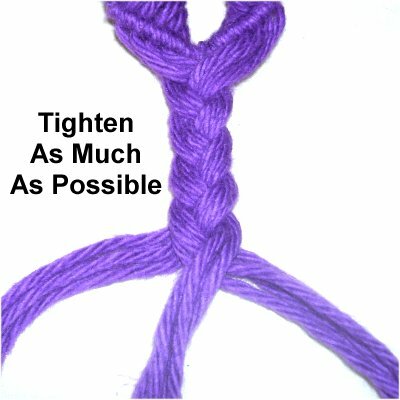 Tighten as much as possible so it's sturdy. Stop when the tie is at least 12 - 15 inches long. 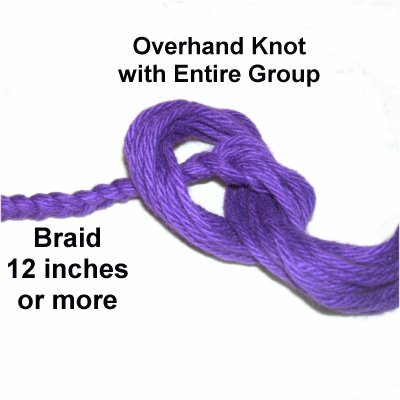 Step 14: To secure the braid, use the entire group of cords to make an Overhand knot. Try to keep the cords neatly arranged. Trim the cords to form a short fringe. Step 15: Repeat steps 10 - 14 at the other end of the Window Belt. Have any comments about the Window Belt? Contact Me.